Cheer on the Emory Eagles as basketball season starts, then fill the rest of your November calendar with free or inexpensive arts and cultural events, learning opportunities and more. November begins the big slide toward the end of the semester. The month, punctuated by Thanksgiving, is filled with arts and cultural events, learning opportunities, thoughtful experiences and healthy and fun things to do, many free or under $10. 1. Cultivate mindfulness with guided meditation. Each Wednesday except for the first and last week of the year, come to Canon Chapel, Room 106, for guided meditation from 5-6 p.m. Beginners and experienced practitioners are welcome; the group is free and open to all members of the Emory community. 2. Learn how to make a documentary video. The workshop “Making Documentary Video,” sponsored by the Emory Center for Digital Scholarship, is Wednesday, Nov. 8, from 2 p.m. to 3 p.m. in Room 303E of the Woodruff Library. ECDS senior video producer Steve Bransford will show you the how-to and provide tips on best results. 3. See a variety of good, free movies. The Emory Cinematheque series “Resisting Fascism” continues through November, concluding with the excellent “Black Book” on Nov. 29. The series features films at 7:30 p.m. every Wednesday in Room 208 of White Hall. Your on-campus film choices also include another film series, “Resistance and Memory,” sponsored by the Claus M. Halle Institute for Global Learning and the departments of Film and Media Studies, Latin American and Caribbean Studies, and Spanish and Portuguese. The series commemorates the end of the civil-military dictatorship in Brazil 50 years ago. “Four Days in September” screens with English subtitles on Thursday, Nov. 9, at 7 p.m. in Room 207 of White Hall. “Hercules 56,” a feature documentary about the 1969 kidnapping of the American ambassador to Brazil, will be Thursday, Nov. 30, at 7 p.m. in Harland Cinema. 4. 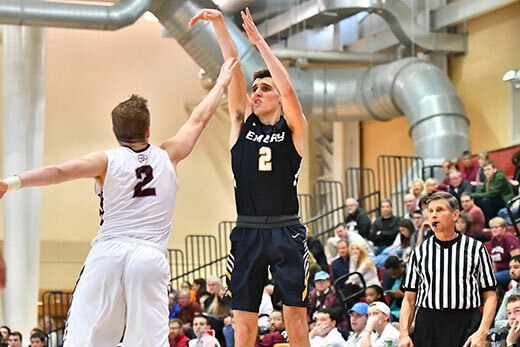 Cheer on the Eagles as Emory hosts opening rounds of the NCAA Division III Volleyball Championship, then keep cheering as basketball season starts. Emory has been chosen as a regional site for the NCAA Division III Volleyball Championship, and the Eagles are seeded first in their bracket headed into the first rounds of competition. See all the action Thursday, Nov. 9, through Saturday, Nov. 11, in the Woodruff PE Center. Tickets for single matches are $4 for students with IDs and seniors; $6 for adults; $3 for children 3-12; and free for children under 2. Passes to attend all sessions are $10 for students and seniors; $12 for adults; $7 for kids 3-12. On Thursday, Emory faces off against Worchester State at 8 p.m. If the Eagles advance to the second round, they will play at 7 p.m. Friday; the regional championship match will be Saturday at 7 p.m. The winner of the Atlanta Regional will advance to next weekend's national quarterfinals in Grand Rapids, Michigan. You can also support Emory's women’s and men’s basketball teams as they open their season on Saturday, Nov. 15. The women’s team plays Rhodes College at 5 p.m. and the men’s team takes on Piedmont College at 8 p.m. The women’s basketball team plays again on Friday, Nov. 17, at 6 p.m., this time against the University of Texas-Dallas and on Saturday, Nov. 18, against Belhaven University at 6 p.m. The men’s team caps off November with a Nov. 29 game at 7 p.m. against Birmingham Southern College. All games are at the Woodruff PE Center and admission is free. 4. Enjoy classical music under the "stars." Enjoy a special musical treat this month with Bach under the Stars at the Emory Planetarium. Two performances will be Friday, Nov. 10, at 7 p.m. and 9 p.m. Astrophysicist and planetarium director Erin Bonning will give commentary with music provided by the Vega String Quartet. The music is free. No late arrivals. 5. Experience the sounds of Ibero-America. Hear the stirring sounds of Spanish art songs sung by soprano Laurie Ann Taylor, accompanied by César Cañón on the piano at Sounds of Ibero-America on Friday, Nov. 10, at 8 p.m. in the Performing Arts Studio. The event is free with no ticket required. 6. Hear renowned Irish novelist Colm Tóibín deliver the Ellmann Lectures. 7. Find out how the skeleton of King Richard III was discovered. Hear the fascinating story of finding the skeletal remains of England’s King Richard III, discovered under a car park (British for parking lot) in the city of Leicester, England. On Tuesday, Nov. 14, the Emory Center for Mind, Brain and Culture welcomes Turi King, the molecular geneticist who led the team that made the discovery in 2012, nearly 500 years after the monarch's death. In a lecture titled "Finding Richard III," King will narrate the discovery process, which sparked a huge public interest. The free event starts at 4 p.m. in Chemistry Room 360 of Atwood Science Building. 9. Join in America Recycles Day. Take advantage of America Recycles Day to give a useful next life to some of your hard-to-recycle items. Bring items such as old paint, confidential documents, light bulbs, batteries and electronic waste to Emory Point outside of the General Muir restaurant between 11:30 a.m. and 6:30 p.m. on Wednesday, Nov. 15. 10. Take time out to be thankful. Get into the real spirit of November’s big holiday by attending a Service of Thanksgiving on Tuesday, Nov. 21, from 11:05 a.m. to 12 p.m. in Cannon Chapel. Hear the Voices of Hope choir from Lee Arrendale State Prison, directed by Candler alumna the Rev. Susan F. Bishop, Arrendale chaplain and choir director.